Nicholas I (Russian: Николай I Павлович, Nikolai I Pavlovich), July 6 (June 25, Old Style), 1796 – March 2 (18 February Old Style), 1855), was the Emperor of Russia from 1825 until 1855, known as one of the most reactionary of the Russian monarchs. Nicholas came to the thrown after the debacle of the Decembrist Revolt, but nonetheless set about to prevent another uprising with a program designed to suppress political dissent at home, and role back constitutional gains in Poland. This resulted in the November Uprising, which Nicholas brutally suppressed. His reactionary policies served to spawn revolutionaries, including liberals, populists and radicals. While many were forced underground during his reign, they would eventually gain momentum after his death. Russia's failure to reform would ultimately lead to the assassination of Nicholas' successor, the reformer Tsar Alexander II of Russia as well as the later rise of the Bolshevik Party. He was born in Gatchina to Emperor Paul I and Empress Maria Feodorovna. He was a younger brother to Alexander I of Russia and Grand Duke Constantine Pavlovich of Russia. Nicholas was not brought up to be the Emperor of Russia as he had two elder brothers who were before him in the line of succession. As such in 1825, when Alexander I suddenly died of typhus, Nicholas was caught in between swearing allegiance to his second-eldest brother Constantine Pavlovich and accepting the throne for himself. The interregnum lasted until Constantine Pavlovich who was in Warsaw at that time confirmed his refusal additionally. In December 25 (13 Old Style) Nicholas issued the manifesto claiming his accession to the throne. That manifesto named December 1 as official date of his reign start. During that confusion a plot was hatched by the military to overthrow Nicholas and to usurp power. This led to the Decembrist Revolt in December 26 (14 Old Style), 1825 in which Nicholas almost lost his life, but ultimately he was successful in suppressing the uprising. 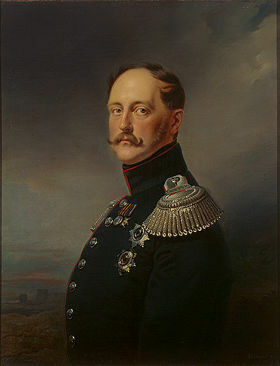 Nicholas refused to abolish serfdom during his reign, since it enabled the landlords to govern the peasants, which the relatively small Russian bureaucracy was unable to do directly. However, he did make some efforts to improve the lot of the state peasants (serfs owned by the government) with the help of the minister Pavel Kiselev. The official emphasis on Russian nationalism contributed to a debate on Russia's place in the world, the meaning of Russian history, and the future of Russia. 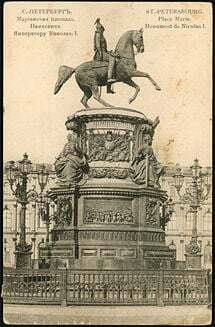 One group, the Westernizers, believed that Russia remained backward and primitive and could progress only through more Europeanization, which included both adopting European customs in Russia and greater integration of Russia into European politics and culture. Another group, the Slavophiles, enthusiastically favored the Slavs and their culture and customs, and had a distaste for westerners and their culture and customs. The Slavophiles viewed Slavic philosophy as a source of wholeness in Russia and were skeptical of Western rationalism and materialism. Some of them believed that the Russian peasant commune, or Mir, offered an attractive alternative to Western capitalism and could make Russia a potential social and moral savior of humanity. The Slavophiles, therefore, represented a form of Russian messianism. At its zenith was the Third Rome theory that postulated that Russia had a unique destiny on the world stage. Despite the repressions of this period, Russia experienced a flowering of literature and the arts. Through the works of Aleksandr Pushkin, Nikolai Gogol, Ivan Turgenev, and numerous others, Russian literature gained international stature and recognition. Ballet took root in Russia after its importation from France, and classical music became firmly established with the compositions of Mikhail Glinka (1804-1857). In foreign policy, Nicholas I acted as the protector of ruling legitimism and guardian against revolution. His offers to suppress revolution on the European continent, accepted in some instances, earned him the label of gendarme of Europe. In 1825 Nicholas I was crowned and began to limit the liberties of constitutional monarchy in Congress Poland. In return, after the November Uprising broke out, in 1831 the Polish parliament deposed Nicholas as king of Poland in response to his repeated curtailment of its constitutional rights. The Tsar reacted by sending Russian troops into Poland. Nicholas crushed the rebellion, abrogated the Polish constitution, and reduced Poland to the status of a Russian province and embarked on a policy of repression towards Catholics. In 1848, when a series of revolutions convulsed Europe, Nicholas was in the forefront of reaction. In 1849 he intervened on behalf of the Habsburgs and helped suppress an uprising in Hungary, and he also urged Prussia not to accept a liberal constitution. Having helped conservative forces repel the specter of revolution, Nicholas I seemed to dominate Europe. Russian dominance proved illusory, however. While Nicholas was attempting to maintain the status quo in Europe, he adopted an aggressive policy toward the Ottoman Empire. Nicholas I was following the traditional Russian policy of resolving the so-called Eastern Question by seeking to partition the Ottoman Empire and establish a protectorate over the Orthodox population of the Balkans, still largely under Ottoman control in the 1820s. Russia fought a successful war with the Ottomans in 1828 and 1829. In 1833 Russia negotiated the Treaty of Unkiar-Skelessi with the Ottoman Empire. The major European parties mistakenly believed that the treaty contained a secret clause granting Russia the right to send warships through the Bosporus and Dardanelles straits. By the London Straits Convention of 1841, they affirmed Ottoman control over the straits and forbade any power, including Russia, to send warships through the straits. Based on his role in suppressing the revolutions of 1848 and his mistaken belief that he had British diplomatic support, Nicholas moved against the Ottomans, who declared war on Russia in 1853. Fearing the results of an Ottoman defeat by Russia, in 1854 Britain and France joined what became known as the Crimean War on the Ottoman side. Austria offered the Ottomans diplomatic support, and Prussia remained neutral, leaving Russia without allies on the continent. The European allies landed in Crimea and laid siege to the well-fortified Russian base at Sevastopol. After a year's siege the base fell, exposing Russia's inability to defend a major fortification on its own soil. Nicholas I died before the fall of Sevastopol, but he already had recognized the failure of his regime. Russia now faced the choice of initiating major reforms or losing its status as a major European power. Nicholas responded to the social unrest in the mid-ninteenth century both at home and abroad by becoming the most reactionary ruler in modern Russian history and among the most reactionary in modern European history. From time to time efforts are made to revive Nicholas' reputation. The Marquis de Custine was open to the possibility that, inside, Nicholas was a good person, and only behaved as he did because he believed he had to. "If the Emperor, has no more of mercy in his heart than he reveals in his policies, then I pity Russia; if, on the other hand, his true sentiments are really superior to his acts, then I pity the Emperor." Nicolas is involved in a common misconception about the railroad from Moscow to Saint Petersburg. When it was to be constructed, the engineers proposed to Nicholas to draw the future road on the map himself. So he is said to have taken the ruler and put one end at Moscow, the other at Saint Petersburg, and then drawn a straight line. But as his finger was slightly sticking out, this left the road with a small curving. In fact, this curve was added in 1877, 26 years after the railway's construction to circumvent a steep gradient that lasted for 15km, and interfered with the railway's functionality. This curving had to be rectified in the early 2000s when the speed of the trains running between the two cities had to be increased. Nicholas married Charlotte of Prussia (1798 - 1860) who thereafter went by the name Alexandra Feodorovna. Charlotte was daughter of Frederick William III of Prussia and Louise of Mecklenburg-Strelitz. ↑ "Tsar's Finger sliced off on the Moscow express", Guardian Unlimited, October 24, 2001.
de Grunwald, Constantin, Tsar Nicholas I, Macmillan Press, 1955. "Information contained in the Country Studies On-Line is not copyrighted and thus is available for free and unrestricted use by researchers. As a courtesy, however, appropriate credit should be given to the series." Please leave this statement intact so that credit can be given. History of "Nicholas I of Russia"
This page was last modified on 8 January 2015, at 17:20.